Ashvale crèche has been open since spring 2005. We are a small independent creche, and childcare is the most important thng to us. We give all our children the best possible care and love that they deserve. Ashvale crèche is a spacious, bright building equipped with a vast array of equipment to facilitate learning and playing. We have a variety of outdoor play area equipped for various age groups and needs. The children spend a lot of time in the outdoor environment – playing, gardening, planting bulbs and much more. My own background has always been family and child focused. I started my career as a nurse and midwife. Please feel free to phone us on 0404 61746 to discuss your child’s childcare needs. We provide many different types of childcare options – from full day to afternoon care. We always try to facilitate parents wishes. In Ashvale crèche we are very conscious of our beautiful environment. We strive at all times to get the children out into the fresh air and promote outdoor play and activities. We have different outdoor areas to facilitate different activities. 2 large grassy gardens are used mainly by the older children; these areas are used for digging, cycling trikes, climbing and balance beams, a trampoline, and much more. We have an astro turf garden for the babies and smaller children; with a playhouse, crawling frames and small slides. We also have a large tarmacadam area for bikes, pretend play and outdoor meals. 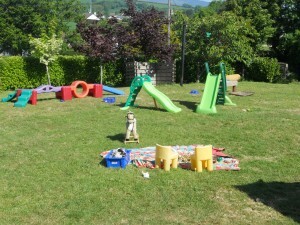 The children enjoy exploring the grounds around the crèche and are always supervised in the outdoors. Copyright © 2011 Ashvale Creche.